Bloody Delicious Red Velvet Hot Chocolate. I Like To Call It Angrysauce. ROAR! I AM MAD SHIBOW! That was pretty threatening, no? No? Oh. Ok, well, maybe I should just talk about my feelings. That’s supposed to be helpful. So late last Monday I was feeling achy and then randomly starting shivering really badly. Like, teeth-chattering, can’t-type-real-words badly. I left work, went to bed, woke up 13 hours later, and could barely move. I didn’t have a cold, I thankfully don’t have the flu, but I was pretty much crippled by some crazy demon disease that still perplexes me. I was in a world of pain that left me at home alone for two full, horribly boring and mostly TV-less (The light burned my eyes. Maybe I’m a vampire now?) days…and then it was gone. Seriously. Whatever hit disappeared as quickly as it had attacked, which left me a little freaked. On a possibly related note, any recent Stamos sightings in the area? Being alone makes you sad. Don’t get me wrong, though, I fortunately had some lovely friends and family checking up on me periodically, but still. I spent a good deal of time laying in bed, getting to know the cracks in my ceiling better, and that really sucked. Being alone makes you sad. It also makes you want to paint your ceiling a different color. I was more than happy to return to work on Thursday, and then MORE than more than happy when my cousin George surprised me Friday morning at the office with a peanut butter and jelly doughnut from Doughnut Plant. Oh. My. Promised. Land. 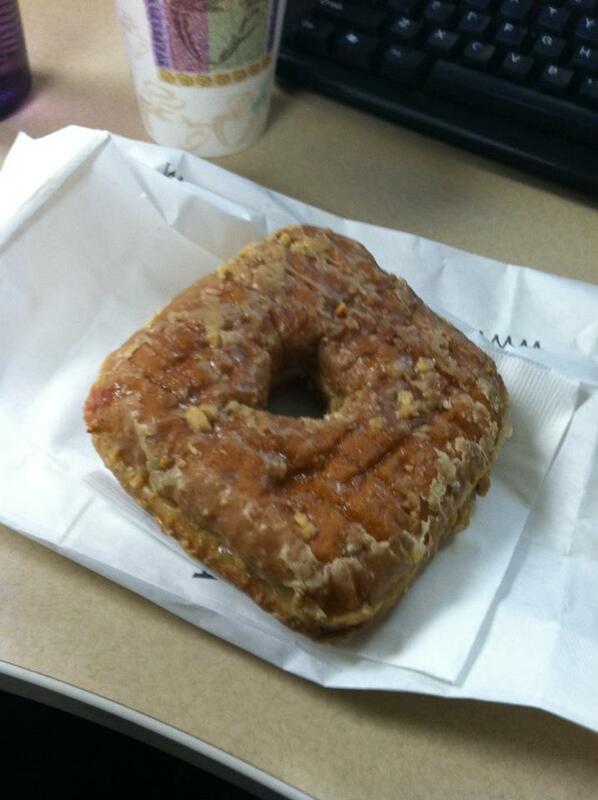 This isn't even the top of the doughnut. My brain was too focused on which corner to rip into first to turn this thing over. So nice, right? George didn’t even know about my mystery illness when he brought me this square-shaped (Btw, the shape makes the distribution of jelly throughout the doughnut more even. Genius.) gift of amazing. It would have made my day anyway, but this was exactly what I needed to turn a bad week right around. Cousin, you RULE. 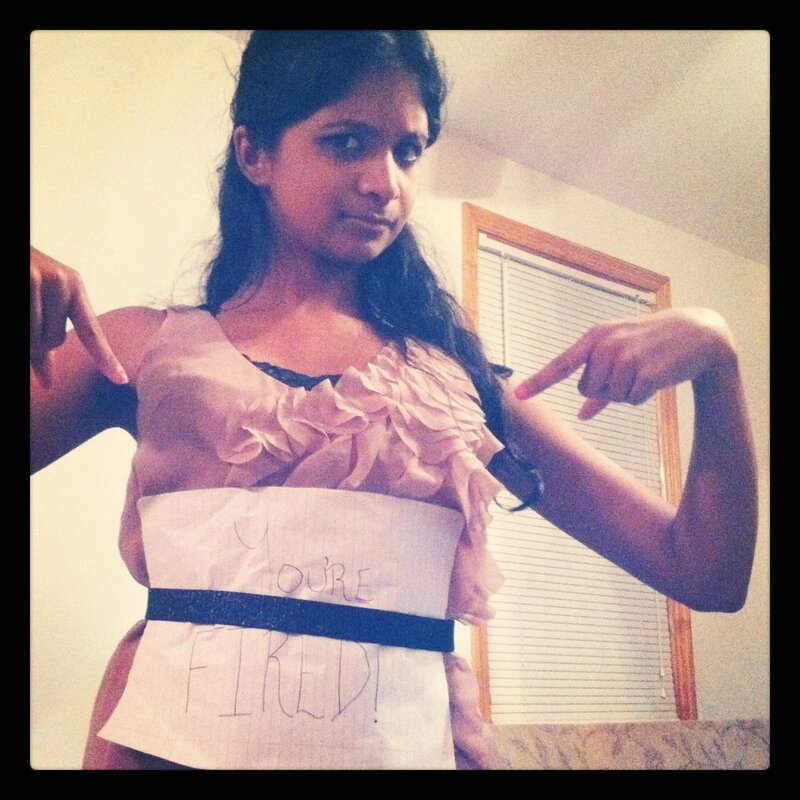 Sylv was a pink slip! 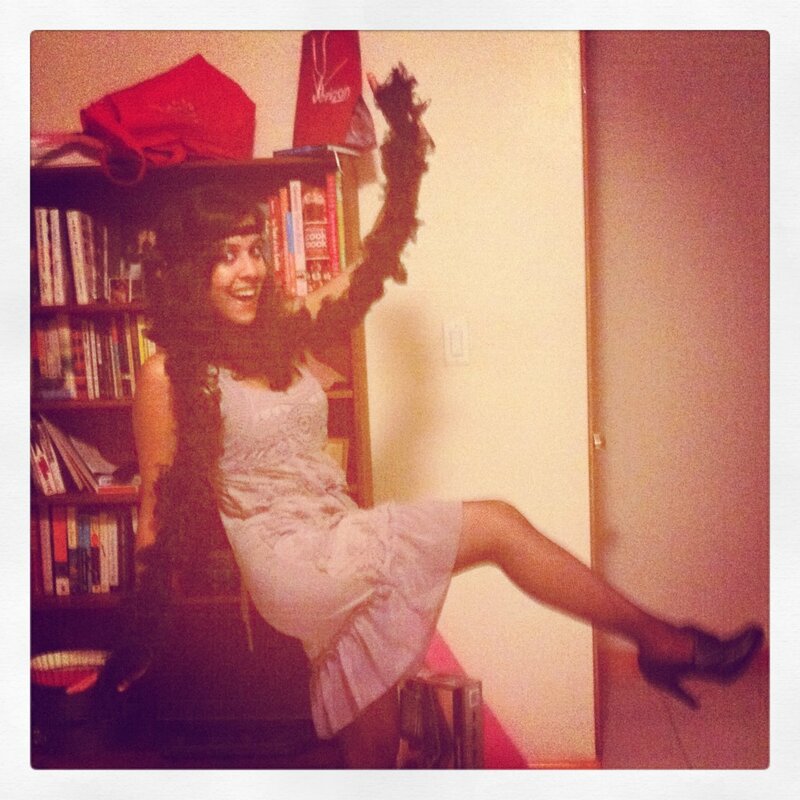 Yes, I did go for the flapper outfit. I’m still pretty winded from whatever it was that attacked me last week, and I’m also seeing red from all of the frustration that illness provoked. 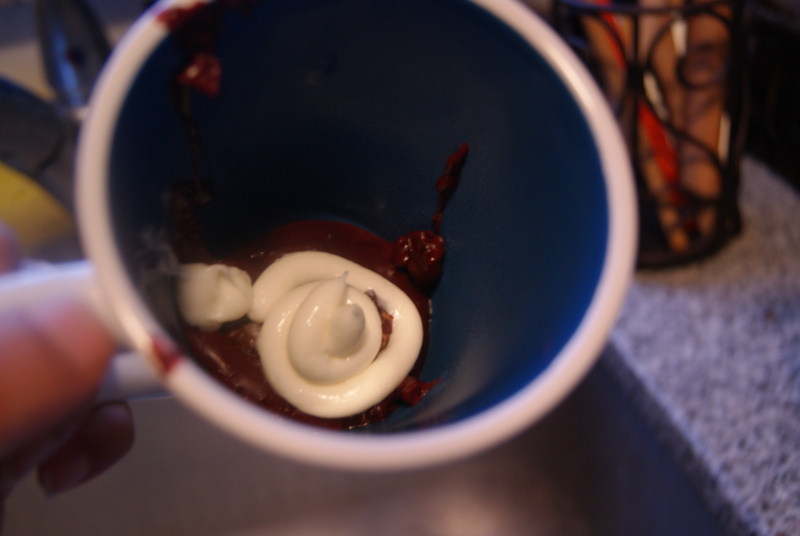 In honor of that, and this especially spooky holiday, I give you Red Velvet Hot Chocolate with a Cream Cheese Icing Swirl. Ok, so this is something that I pulled out of the sky. I mean, I am sure it exists out there, and a quick Google search would confirm as much, but I’ll leave that up to you. This, I am going to base on my favorite hot chocolate recipe, with tweaks by yours truly. Before we begin, I should tell you that this is not your typical hot chocolate, and not just because it’s red. This is a thicker hot chocolate with an almost pudding-like consistency. It’s also quite dark and rich, so if you like your hot cocoa Nestle-style, maybe this is a no for you. It should really be a yes, though. Just sayin’. 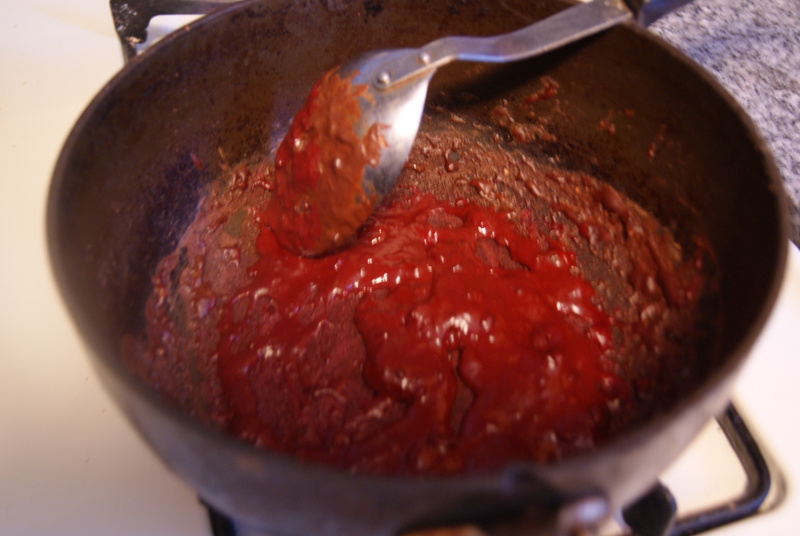 Combine all ingredients except the food coloring in a small saucepan over medium heat. When the mixture starts to bubble and boil, add the food coloring and stir until blood red. Muahahahaha. In the meantime, let’s work on our single-serving icing. Mix in a small bowl with a hand mixer until fully whipped. Spoon into an icing decorator if you’re a dork and own one (I’m a dork and own one) or just scoop it into your cup with a regular ol’ spoon. Pour the contents of your bloody saucepan into an appropriate mug–I’d go for an espresso cup if you’ve got one since these are small but potent servings– and top off with your icing. So even I was a little shocked at how well this turned out. I was really impressed with how much a simple cup of hot chocolate could be enhanced by a little dollop of icing, but, damn, it could. And it was. I know you can’t really see much, but that’s because I own monstrously large cups for some reason, which makes no sense since I am so small I can barely reach the top shelves on any of my cabinets. Maybe I’m compensating. In any case, have a Happy Halloween, and stay out of trouble, kids.